CHICAGO/JANUARY, 12th 2017 – The Best Bar Ever, a Chicago, IL-based manufacturer of fresh, real food nutrition bars, announced today that it has entered into a partnership with Charlotte, NC-based Europa Sports Products, the country’s largest wholesale distributor of high-quality health and sports nutrition products to gyms and specialty stores. Best Bar Ever, which was born out of a customized meal service company in July 2014, is currently on a multimillion-dollar run rate servicing over 1,000 retail locations nationwide. 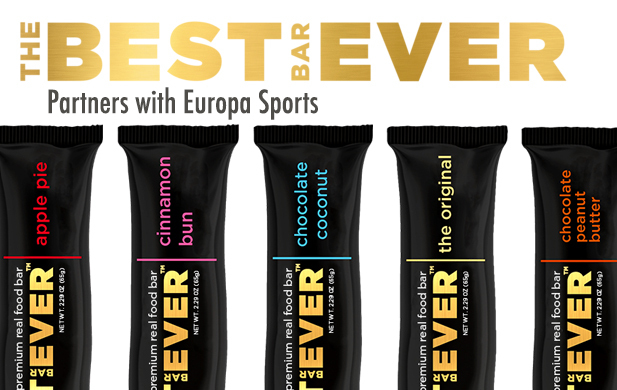 The newly formed partnership with Europa Sports is expected to expand Best Bar Ever’s distribution and rapidly accelerate the brand’s growth through Europa’s network of thousands of gyms, health foods stores, and specialty retailers across the U.S., beginning in January 2017. In addition to its Original flavor, which contains no added preservatives or gluten, The Best Bar Ever currently produces five other all-natural flavors that contain no artificial flavors or sweeteners and are also gluten-free: Chocolate Peanut Butter, Apple Pie, Chocolate Coconut, Cinnamon Bun, and Cookie Dough. One of the things that make these real-food-based bars so unique is the fact that they are found in the refrigerated section of the stores/gyms they’re sold in, versus on a shelf with most other bars. Conveniently designed to fit into the drink slot of a refrigerator, this innovative brand represents a new category of fresh food bars whose name truly says it all. In fact, their delicious taste is actually how these bars got their name. “This is the Best Bar Ever” is the most common thing people say after trying it. “We’re excited to give our customers another unique product offering to help grow their respective businesses. Between our refrigeration capabilities and multiple distribution centers, we can efficiently distribute the Best Bar Ever across the country,” states Eric Hillman, Europa Sports Products CEO and Co-Founder. This partnership with Europa marks a very exciting milestone for the company, as it affords thousands of new individuals a chance to experience what truly is The Best Bar Ever.